What is menstruation and what are the events which occur menstrual Cycle? What is menstruation and what are the events which occur in menstrual Cycle? In this article, I gave an account of how the various events which occur in the menstrual cycle and menstrual flow of the monthly reproductive cycle of a human female. I dealt with the various aspects of puberty, menstrual cycle, the role of hormones in menstruation and menstrual cycle in a scientific way. Menstrual Cycle is a natural event which occurs regularly in a month wise fashion in the female reproductive system of a woman during her reproductive phase. Menstrual cycle prepares ovaries and uterus to make ready for pregnancy. The menstrual cycle is necessary for the formation of egg or ovum and also prepares the uterus for pregnancy. Puberty is the attainment of youth and at which age in a young female the onset menstrual flow occurs, ovaries become matured and start producing eggs. In every menstrual cycle of a month, secretion of female hormones occur which helps to influence secondary sexual characters in female, helps the ovary to secrete egg and also prepares the uterus to receive fertilized egg. The reproductive phase of a female usually starts at the age of 11-13 years and it extends up to 45 years. The onset of menstrual flow in a young female at puberty is known as menarche.The stoppage of menstrual flow at the age of 45 years in a woman is known as menopause.During the reproductive phase of a woman, which extend between 11-45 years it is expected that is around 400 fully matured eggs are prepared by both the ovaries together which are fit for fertilization. But in the monthly reproductive cycle of a woman, only one egg will be released by one of the ovaries alternatively every month. The reproductive cycle from the start of development of egg cell to the shedding of the uterine lining is called menstrual cycle and takes approximately 28 days in the human female. The shedding of the uterine lining in the event that the endometrium of the uterus not receiving fertilized egg is known as menstruation.The mucous lining layer of the inner wall of the uterus where the fertilized egg gets implanted is known as the endometrium. 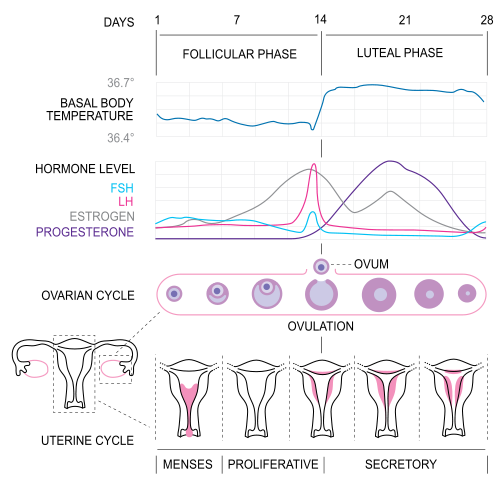 Mentrual flow occurs in a female on 28th day of menstrual cycle if the uterus is not able to receive a fertilized egg. Menstrual flow lasts for 3-5 days during which the uterine wall or the thickened inner lining of the uterus is shed off along with the oozing of blood from the ruptured blood vessels and capillaries. So the shed off material, oozed out blood, and unfertilized egg flow out through the vaginal canal as menstrual flow. Ovaries of the female reproductive system include the structural-functional units called follicles at the time of birth itself. A follicle is a cellular sac filled with a fluid in which the egg develops. About such two million follicles present in both the ovaries together in female and which are at different stages of their growth. In the monthly menstrual cycle of a woman, one such follicle under the influence of female hormones is able to attain maximum growth and it appears on the surface of the ovary is known as a Graafian follicle. This fully grown follicle ruptures and releases the egg through ovulation process. During this follicular phase, certain hormones are released by one of the follicles growing towards maturity which reactivates uterine wall to get thickened which got ruptured during menstrual phase. This thickening and building of uterine wall with rich blood supply are essential to prepare a hospitable environment and provide nourishment for the growing embryo if the uterus receives a fertilized egg. Due to this Follicular phase, uterus lining rethickens, with an increase in blood supply and glands become longer. This phase extends up to 5-12 days of the menstrual cycle. It occurs on 13-14 the day of menstrual cycle. At this phase the fully matured Graafian follicle which appears on the surface of ovary ruptures and releases the egg through a process ovulation. The released egg will be picked up by fimbriae of oviduct or fallopian tube and is transported up into the uterus. During the course of its travel, the egg gets fertilized in the oviduct if copulation or mating occur at this period. In this phase, the remnants of the Graafian follicle after the release of egg is transformed into a yellow colored substance called Corpus luteum. This Corpus luteum starts secreting Progesterone hormones which promotes further thickening of uterine wall which makes the conditions favorable for implantation of fertilized egg on it. This process continues from 14 - 28 day of the menstrual cycle. If fertilization occurs in 15-17 day of menstrual cycle, the uterus lining further thickens, the fertilized egg gets implanted on the endometrium of the uterus, and the menstrual cycle stops temporarily for the entire pregnancy period. If no fertilization has taken place menstrual flow occurs and fresh menstrual cycle starts again. The hypothalamus and Pituitary gland of brain through their hormonal secretions mostly control the various events in menstrual cycle. Hypothalamus of brain secrets Gonadotropin-releasing hormone (GnRH) which stimulates the anterior pituitary to secrete gonadotropic hormones FSH (Follicle Stimulating Hormone) and LH (Luteinizing Hormone). FSH secreted by anterior pituitary travels through blood and reaches its target organs ovaries. Then this hormone stimulates some of the follicles of the ovary of which one of them reaches to its complete development. The granulosa cells of ovary which are endocrine in nature start to secrete Oestrogen hormone. The steroid female hormone, oestrogen acts on two targets-uterus and anterior pituitary gland. This hormone reactivate the uterus to build its ruptured uterine wall during menstrual phase. This change occurs in uterus in anticipation of possible pregnancy if it receives a fertilized egg. Oestrogen acts on the second target anterior pituitary to stop the secretion of FSH which prevents the further follicles to get stimulated in ovaries and to ensure the release of only one egg in a menstrual cycle. In course of time, the Oestrogen levels increase in the blood which triggers the secretion of LH hormone from anterior pituitary. With increased levels of Oestrogen and LH hormones ovulation process is promoted. After ovulation, the remains of Graafian follicle transforms into a yellow colored mass which starts secreting progesterone hormone. Like Oestrogen, progesterone hormone acts on two targets-uterus and anterior pituitary. Progesterone hormone helps in further building of inner lining of the uterus to make the conditions favorable for the implantation of fertilized egg on it. This hormone also play an important role in maintenance of pregnancy. The second target for this hormone is anterior pituitary and by its influence it stops the secretion of both FSH and LH from it. If no fertilization occurs, shedding of uterine lining occurs, Oestrogen and progesterone levels decrease which removes the inhibition on the secretion of FSH and LH which ultimately promotes follicle development and ovulation again. Menstruation is something that every girl has to pass through. Normally the cycle lasts for 4-7 days. Some get stomach aches, knee or back pains etc. But for some it is just like another normal day. Some people even get pimples close to their cycle, it is an indication that she will have her cycle soon. Stomach pains for few hours is a normal case but if it lasts for more than 12hours, it is better to consult a doctor. The sad part now is due to the increasing consumption of junk foods, children get menstruation at an early age. Earlier it used to start only by the age of 14 or so. But now, even a fifth standard girl might have got it. As they are small they do not know the hormonal changes happening in their body. I feel they are too young to undergo all these. A very nice article illustrating all the things about menstruation cycle and its importance for reproduction. I just want to add one thing that though the menstrual cycle may be normal but due to various reasons a woman may not be able to conceive. One of those things is childhood illness and unhuygenic conditions specially in the poor families. The two fallopian tubes transporting egg alternatively to uterus are very narrow or thin and due to some infection or disease they are often choked and arrest the egg to reach the uterus and the woman is not able to conceive. So it is necessary that we should have good hygiene conditions for the female child. This beautiful article has explained the perfectly natural phenomenon of menstruation among women of age of 12 to 52 (in general). From academic point of view, I find the article excellent and would be immensely helpful for students of Biology. I would recommend this article for every Biology student from IXth standard to XIIth standard. However, I think that the article has been silent on the social aspect of menstruation. Even in 2017, a large number of people (both men and women) think that during this period women become impure. They forget that this phenomenon is essential for every woman to become a proud mother. Without this, women won't be able to become a mother. Every educated person should read this article for properly understanding of menstruation, which would help demolition of various ridiculous myths and superstitions. Also, I think that the author could have discussed hygiene factor during menstruation. Every woman must understand the importance of maintaining hygiene during this period, which is generally neglected among the economically weaker sections of society in every underdeveloped and developing country. A concise article that reads almost like a medical article or chapter. This article would be useful for women and young couples to understand the relations of medications, fertility and some of the principles of family planning methods commonly used. I think we need to encourage mothers to update their daughters more about the events and changes that occur with the beginning of puberty rather than they trying to learn from others and friends. Given the nature of focus of this article, I think the author has not focused on taboos and safe self-care during the menstrual period. Glad to say that there are some programs like the 'Support A Woman Program', wherein NGOs and companies come together to ensure the every girl/woman has a healthy and hygienic lifestyle with relation to menstruation and blood loss. Arunachalam Muruganantham, a school dropout found innovative ways to make low cost sanitary pads for rural women by devising a simple low cost machine. He has helped many poor women and is unceremoniously called the Menstrual Man.